Here's a great deal on this 4 Piece Square Copper Cook Set with Glass Lid! It retails for $89 and is currently $75 on Amazon with 5 star reviews. Right now you can go here and get it for just $34.49 plus free shipping. I have this and it is awesome!!! The Breakthrough, All in One Kitchen Miracle: Bake, Fry, Broil, Saute, and Steam! Copper Chef's Cerami-Tech Non-Stick Technology lets you cook without added oils and virtually NO clean-up. Copper Chef works on all Stove Tops and is Heat Resistant up to 800°, giving you delicious meals from Stove Top to Oven to Table Every Time. Fry Frying foods has never been easier. With even heat distribution, food will always be perfectly browned and crispy. The Copper Chef's specially designed fry basket allows you to drain off any excess oil for crispy results without all the grease. Roast With Copper Chef's square design, large cooking capacity, and even heat distribution you will enjoy juicy, perfectly cooked meals from oven to table. 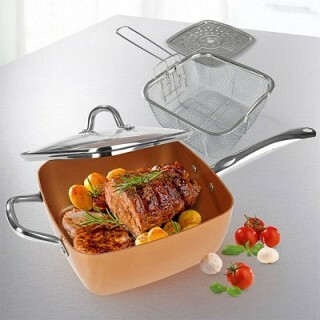 Steam Copper Chef's steamer tray makes steaming a breeze. Have healthy, moist delicious meals in a snap. 1-Double Top Layer- Polished ceramic coating. PFOA/PTFE free. 2-Base Layer- non-stick ceramic coating. 3- Aluminum Core- Provides excellent thermal conductivity and heat distribution. 4-Outside Layer- High temp exterior coating. - Induction Base- Stainless Steel induction base heats up faster and retains heat longer.